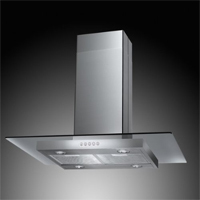 For a modern European-style range hood for a reasonable price, this Akdy 30-inch model mounts over a kitchen island and features brushed stainless steel and a glass visor. Compared to some other models, it’s relatively quiet and runs efficiently, pulling vapors, smoke, and impurities from the range. With an anodized aluminum filter that detaches easily and goes through the dishwasher, the hassles of cleaning and maintaining the hood are minimal. Island range hoods are usually quite pricey, but this Akdy model works really well and is available for $389.